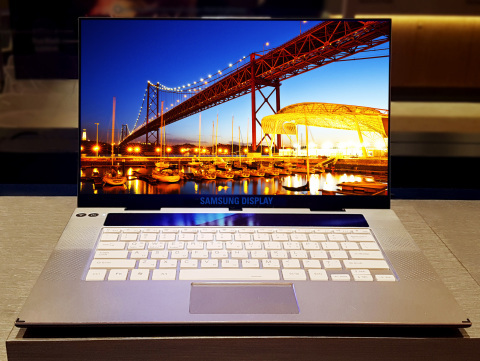 SEOUL, South Korea--(BUSINESS WIRE)--Samsung Display today announced that it has succeeded in developing a 15.6-inch UHD (3840 x 2160 pixels) OLED panel ― the world’s first UHD display for the notebook/laptop market. The display technology giant said it will begin mass producing the 15.6-inch UHD OLED panel in mid-February, initially for use in premium notebooks produced by leading manufacturers. The newly released display will provide ultra-high resolution optimized for gaming, graphic design and video streaming. Samsung Display emphasized that its 15.6-inch UHD OLED panel meets the latest DisplayHDR True Black specification released by VESA® (Video Electronics Standards Association). With black color that is a hundred times richer than the previous HDR standard, Samsung Display’s newest panel brings a very significant enhancement to HDR, in depicting high-contrast almost as well as the human eye, making black imagery blacker and white images whiter. Samsung Display Co., Ltd. is a global leader in display panel market, with OLED and LCD technologies and products. Employing approximately 70,000 people at nine production facilities and 16 sales offices worldwide, Samsung Display specializes in high-quality displays for consumer, mobile, IT and industrial usage, including those featuring OLED (organic light emitting diode) and LCD technologies. As a total solution provider, Samsung Display strives to advance the future with next-generation technologies featuring ultra-thin, energy-efficient, flexible, and transparent displays. For more information, please visit www.samsungdisplay.com.